These days, the 30s are the new 20s, and the 40s are the new 30s. But with the nation's 78 million baby boomers now entering their 60s at the rate of approximately 8,000 a day, the 50-and-older group has undergone a rather youthful transformation as well. What was once the typical age to start thinking about retirement has become the time to consider a career change -- particularly into self-employment. Business ownership is a logical step for the mature work force, says MetLife Mature Market Institute executive director Sandra Timmermann, who cites incentives like having more control and flexibility in their lives; a desire to pursue personal dreams; or, less agreeably, a measure against age discrimination. "It seems an ideal time to launch out into something you've always wanted to do and even be a mentor to younger people," she says. "You know how to work smarter, and you really know what you want. You have experience and resources and may not be starting from scratch." Timmermann, a gerontologist, notes two reasons people are staying in the work force longer: One is that the older generation is healthy and still very active; the second cause is rooted in finances. A 2008 McKinsey Global Institute study revealed that two-thirds of boomer households are financially unprepared for retirement. And Timmermann adds, "Expenses are high because they're helping their children and grandchildren." In 2011, the first of the nation's baby boomers will turn 65, but if pollsters are right, vast majority will be working well into their traditional golden years. Says Timmermann, "We have a great resource in the country of people who are older, and they will change the way we think about the work force. It's just the beginning." Whether you're twentysomething, thirtysomething or fiftysomething, the important thing to remember is that building a successful business is an undertaking that requires a monumental amount of time and effort. The main difference is that as you get older, the risk of failure--and its resulting consequences--may loom larger. Confidence and experience helped the three entrepreneurs profiled in this article make the right decision to start a business after age 50, and they have clearly demonstrated that when it comes to business acumen, older definitely means wiser. 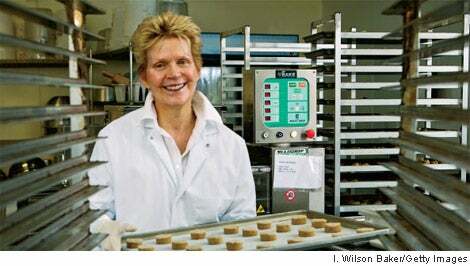 Judith Moore, 61, founder and CEO of Charleston Cookie Co. in Charleston, South Carolina, turned her lifelong baking hobby into a profitable business and considers herself too young and productive for retirement. "[If I were retired]," she says, "I would probably make anyone around me insane because I have too much energy to just be playing all the time." A former marriage and family therapist, Moore traces the origins of her business to Christmas 2001. "I went on a quest for the perfect chocolate chip cookie, but I went through a whole bunch of recipes and couldn't find one I liked," she says. So like a model entrepreneur, she stepped up to the plate. Her cookies soon gained an avid following, and in 2003, Moore subleased a small space and opened up shop. Six years later, Charleston Cookie Co. occupies a 5,000-square-foot warehouse and is projected to break $1 million in sales. Moore has learned plenty of new skills on the job and says that's part of the thrill. "When I started, I had never opened an Excel spreadsheet before," she recalls. "But for the business plan, I had to learn how to do cash-flow projections, costing and accounting myself. It was painful, but it was like, welcome to the life of an entrepreneur." Although her retirement was interrupted in favor of the business, Moore does plan to step back from daily operations within the next five years. "I don't have the energy I did when I was 30 or even 40," she says. But she does have some words of wisdom for the older entrepreneur. "You better be doing something you love. And if you're not risk-tolerant, you shouldn't be running a business, regardless of how old you are." After 32 years in the tech industry, Martin Waugh caught his big break as a photographer, offering proof that a hobby business can become a viable career at any age. In 2001, he began a side business called Liquid Sculpture, selling images of water drops captured midsplash to advertisers and individuals. The transition from part time to big time, which happened in his early 50s, was an accident, he says. "Liquid Sculpture was discovered by the internet sometime in 2005; it was wild," Waugh, now 54, recalls. "One day my website had 30 visits a day, and the next, 3,000. In a month, a million people had seen my work." He quickly realized the business opportunity on his hands, quit his job as a software architect and ramped into full-time work as a photographer. Having dabbled in the venture for several years beforehand, Waugh's transition was relatively smooth, and sales are up 70 percent since he started. Waugh's prior experience also provided a big boost to his confidence, which helped him when he encountered skepticism about his career move. "You can't listen to the detractors," he says. "They're stuck in their matrix and typically not very receptive." For Waugh, running the side business meant all the difference: "I had a better idea that there was a 'real' life after my career." Waugh's vision is to be the major supplier for water pictures in the advertising industry and advance his work in the fine arts world. "Those are difficult to do simultaneously," he admits, so retirement is still many years away. But you won't catch him complaining. He quips, "I often think, 'Oh my God, whose life am I living? I hope he doesn't want it back anytime soon and in the same condition I got it.'" of boomers intend to finance their business startup with their savings. Dan Croft, CEO and president of Lincolnshire, Ill.-based Mission Critical Wireless, used a quarter-century's worth of experience in the wireless industry to pave a relatively seamless path into entrepreneurship. At the end of 2004, Croft left his post as senior vice president of marketing and business development at Motient Corp. (a former division of Motorola) in favor of starting Mission Critical Wireless, which assists enterprises in implementing wireless services. Although he had funding and a group of talented employees, not having a reputation was a drawback. But as an experienced executive-turned-entrepreneur, the transition wasn't quite so shocking. "I wasn't a 23-year-old, starry-eyed kid who thought he was going to [be] the next Bill Gates," he says. "I knew how challenging it would be." For Croft, 54, entrepreneurship is more extreme than the corporate world. "The highs are much higher, the lows are much lower--and the lack of sleep is much greater," he says, laughing. Retirement, however, isn't in the plans. "My goal is not to be on a tropical island; it's to have this place flourish," he says. "At the end of our first 30 days, our revenue was zero. Today, we have approximately $3 million in annual revenue. To see the activity going on now and know we built that from nothing is great." No matter what your age, setting proper expectations for your business is key, Croft says. Cut your sales forecast in half and expect plans to take triple the amount of time to implement and cost twice as much. "If you still like the model, then go for it." Sandra Timmermann, executive director of the MetLife Mature Market Institute, says mature workers should consider the following three questions carefully before making the move to self-employment. Although these questions are applicable to would-be entrepreneurs of any age, they take on additional importance for those in the older demographic, who must weigh their decision against the lifestyle they could enjoy in traditional retirement. How will I handle the loss of benefits like health and life insurance? People tend to stay at their current job because of benefits. Take this into account and make sure you won't be exposing yourself to too much risk. Do I have a way to address any skills I'm lacking before I start a business? Lacking the skills required to enable your business success can be a real concern when you're older--but don't worry, there are ways to address this: Take a community college class, seek out mentors or start a trial venture. And if you're still working, be sure to take advantage of the extra prep time. Am I really a self-starter? If you are older, carefully consider if you have what it takes to start over. If you're too used to working for others or lack the energy and commitment to put in the long hours, be honest with yourself. Owning a business is a fun concept, but if you're unprepared, reality bites.